Claim your free copy of The First 100 now! 110% Free. You'll get the book in PDF format. Are you thinking about or in the process of launching a start-up? If so - I want to share with you my step-by-step framework for acquiring your first 100 customers. These tactics have been used by the likes of Tony Robbins, Snoop Dogg, Google and Salesforce for years... and now, I'm sharing them directly with you. Some call it an eBook. I call it a bible. 6 case studies that demonstrate what to do and what NOT to do. This isn't a 10 page "guide". It's a 139 page book filled with actionable insights. The First 100 rewards those who do. The book includes 18+ worksheets and activities to check your understanding of the material and propel your business. I’m the founder of Rootstrap, an-award winning digital studio that has helped hundreds of startup founders validate their start-up concept and launch their businesses and get funded. Getting the first 100 customers is often the most challenging part for any new start-up, but with our tried and tested framework, we'll make the process 10x easier for you. It doesn’t matter what type of business you are launching - this framework can be adapted for use in any industry, period. 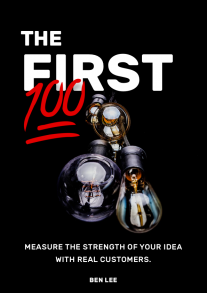 Download your free copy of “The First 100” now. 39,643+ words to put you miles ahead of most founders. You'll get the book in PDF. “Starting a company is the hardest thing I’ve ever done. At the early stages, you feel overwhelmed with decisions and an immense pressure to grow your customer base. "This isn't your typical freebie guide. It's a PRICELESS book packed with actionable insights. It was the guiding 'northstar' for my business and I know it will be for yours too." Co-founder of Rootstrap, Columnist at Forbes, Huffington post, Inc.com & Business.com. Ben's also been featured in Inc.’s 2016 list of 30 Under 30 Most Dynamic Young CEOs. Recently, Ben’s two development agencies merged to become Rootstrap: a world-class digital development studio with more than 70 employees, offices in LA, New York, Uruguay, and Leipzig, and hundreds of successful projects on the shelf. Get the PDF delivered straight to your inbox.